Cure Hams. 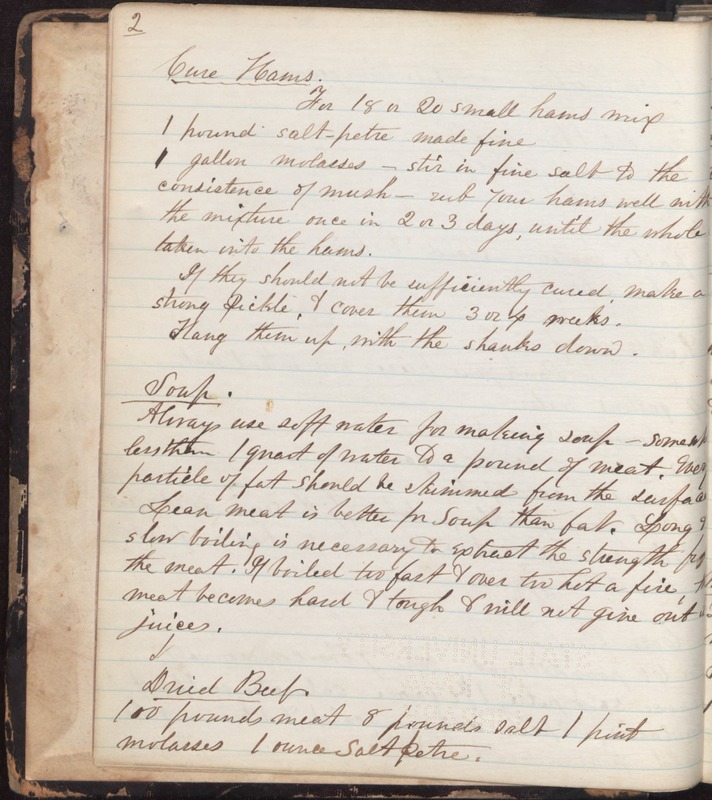 For 18 to 20 small hams mix 1 pound salt-petre made fine 1 gallon molasses - stir in fine salt to the consistence of mush - rub your hams well with the mixture once in 2 or 3 days, until the whole taken into the hams. If they should not be sufficiently cured make a strong pickle, & cover them 3 or 4 weeks. Hang them up with the shanks down. Soup. Always use soft water for making soup - [somewhat?] less than 1 quart of water to a pound of meat. Every particle of fat should be skimmed from the surface. Lean meat is better in soup than fat. Long & slow boiling is necessary to extract the strength [from?] the meat. If boiled too fast & over too hot a fire, then meat becomes hard & tough & will not give out its juices. Dried Beef. 100 pounds of meat 8 pounds salt 1 pint molasses 1 ounce saltpetre.